Piglette presents a specially chosen selection of baby gifts, ideal for a newborn child and parents. Just click on the pictures of the items you like for prices and to details of how to buy with the convenience of online shopping. A centuries-old tradition is reborn with your gift of one of these beautiful commemorative birth plates. Deeply sculpted and artfully engraved, this German-crafted pewter birth plate will be your baby's first and most memorable keepsake. Record all the details of the blessed event, including baby's first and middle names (up to 20 characters in total), plus last name (up to 20 characters). You can also include the weight, up to 15 chars, length, up to 15 chars, and birth date, up to 8 characters, as well as time of birth, all presented together in this wonderfully styled plate, full of beautiful old-world charm. Your plate measures 9" diameter and is imported from Germany. Thes cuddly puppies are the perfect bedtime buddies! Before dozing off to sleep, your baby can play with the plush puppy dog, featuring a rattle inside his tummy. And parents will also cherish this cute gift, with his soft blankie embroidered with baby's name and birth date, up to 8 characters each. Available in blue or pink, each measures 10 inches in length. New parents will cherish this 100% pure pewter heirloom cup. It is engraved with any name up to 15 characters and date below. This magnificent pewter personalized baby cup Holds 6 oz and is handcrafted in England. Welcome the new little one with a wonderful assortment of baby items including socks, a teether, decorated bottle, baby-soft bath products and a T-shirt. This super packed basket also contains a cuddly receiving blanket, diaper and wash cloth, and an adorable oh-so-cute plush animal. 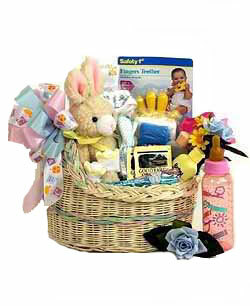 There are also herbal teas for mom and chocolate cigars for dad, all wrapped up in a lovely wicker bassinet! A great gift for family, coworker, or friends, it comes specially packaged to welcome either a boy or girl. Buy one share of stock of The Walt Disney Company as a gift easily with with no deposits or setup fees. This is a perfect gift for a newborn baby and the perfect way to start a childs investment. A number of high quality framing options are available. These single shares can be owned and sent internationally, and are genuine stocks, tradeable on the stock exchange. Many other other companies' shares are also available. This plush teddy bear comes "bearing" an elegant small vase arrangement of roses, alstroemeria, mini carnations and limonium. He is so cute that parents and baby alike will absolutely adore him forever. Please bookmark Piglette for all types of exciting and unique gift ideas, flowers, bonsai trees plus lots more quality items at great prices. Celebrate a newborn child's birth in style a silver baby cup and sterling silver baby cups. Check out useful baby safety items including safety gates, high chairs, car seats and much more at Baby Safety Gate. Ensure comfortable, healthy air for your baby with air humidifiers at Best Humidifier. More cute Teddy Bears at BearsInTheBarn.